China produces by far the most salt of any country on earth—about 90 million tons a year. Of this figure, 91 percent are non-edible industrial salts that contain heavy metals and other dangerous substances. But with regulations lax and for the sake of a quick buck, manufacturers nationwide are ignoring these details. On April 26, it was reported by China National Radio that 35 tons of industrial salts had been packaged as edible salt and partially distributed to the market in Shijiazhuang, northern China, at the time discovery by police investigation. The partial seizure is just the tip of a massive illicit industry operating on a national scale, from Beijing to the edges of China in far-flung provinces like Yunnan, Zhejiang, or the territory of Inner Mongolia. Industrial salts marked for human consumption may contain hazardous metals such as lead, arsenic, mercury, or nitrites. The gradual buildup of these substances in the body contributes to nerve damage and cancer. 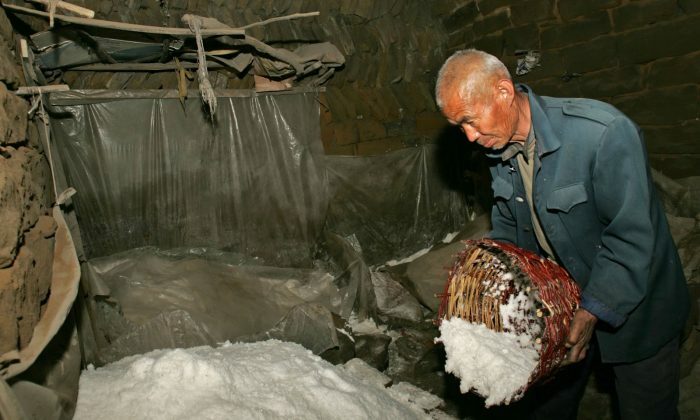 The Shijiazhuang workshop raided by police was found to run a minimalist production process: after procuring the industrial salt, workers would shovel it into small plastic bags—to be sold on the local farmer’s’ market or local stores after being mixed with genuine table salt. Last July, a small workshop in Taizhou, Jiangsu Province, was caught selling 20,000 tons of industrial salt over a period of seven years to seven provinces and major cities, including Beijing and neighboring Tianjin. According to Zhou Lügang, deputy head of salt administration in Taizhou, said that the case involved an unusually high figure. Twenty thousand tons of salt is enough to supply five million people—the population of Taizhou, incidentally—for a year. Fake table salt is either used directly by unfortunate customers, or used to pickle vegetables in workshops, supermarkets, school cafeterias, and restaurants. The salt itself is very cheap to produce and can be priced lower than genuine table salt, making it an attractive choice for the unaware. The illicit and profitable trade is aided by the fact that industrial salts can be purchased in bulk by anyone with commercial documentation from the chemical industry, including a wide range of associated firms. Worse, Chinese legal bodies stipulate that only cases involving over 20 tons of fake salt will be prosecuted. Such finds are rare: according to a regulations worker in southern China speaking to local state media, workshops tend to produce small, fixed quantities and immediately sell their stock as it comes out. In 2012, of the 182 cases involving fake salt filed in Guangzhou, southern China, police could make arrests only in 21 cases and sentences were handed down for only 13. In 2013, only seven involved arrests and courts made just four sentences. Penalties are light: less than two years’ jail time for a minor transgression, the regulation worker said, so many offenders return to the trade upon completing their sentences.